MORE THAN 400 people have been killed in the five-day assault by the government on Eastern Ghouta, where UN Secretary-General Antonio Guterres said 400,000 Syrians are living in “hell on earth”. After two weeks of negotiations, Russia today told the UN Security Council that there was still no agreement on a 30-day ceasefire in Syria, dimming hopes of international action to halt the carnage in Eastern Ghouta. During a council meeting called by Russia, Ambassador Vassily Nebenzia presented a new raft of amendments to a draft resolution that would allow deliveries of humanitarian aid and medical evacuations during the pause. 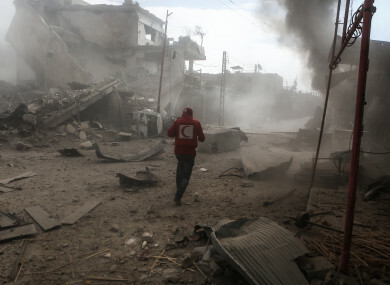 Negotiations on the draft presented by Sweden and Kuwait on 9 February have dragged on as hundreds of Syrians have died in a fierce government air campaign in the rebel-held enclave of Eastern Ghouta. Nebenzia told the council that Sweden and Kuwait had requested a vote on the draft resolution even though they are “fully aware there is no agreement on it”. The Security Council needs to reach a “feasible” agreement on a ceasefire and not take a decision that would be “severed from reality”, said Nebenzia before circulating an amended text. UN diplomats resumed talks in a last-ditch bid to avoid a Russian veto and a vote at the council was now considered for tomorrow. “We are trying to find a way forward,” Swedish Ambassador Olof Skoog said after the meeting, adding that he was “leaning towards a vote” on Friday. The United States, France and Britain called for a quick vote to address the acute crisis on the ground. “The United States is ready to vote on this resolution right here and right now,” said US diplomat Kelley Currie. The assault from the regime is relentless, and the suffering is overwhelming. The US State Department later joined in the criticism, saying Russia had a “unique responsibility” for the situation in Eastern Ghouta. “Without Russia backing Syria, the devastation and the deaths would certainly not be occurring,” spokeswoman Heather Nauert told journalists. In his address to the UN Security Council, Nebenzia cited concerns over enforcing the ceasefire and questioned the feasibility of quickly launching a major aid operation to reach civilians and lift sieges. He accused supporters of the ceasefire of seeking to create “a scandal in order to step up pressure on the Syrian government and taint the Russian government”. The draft resolution would pave the way for the truce to go into effect 72 hours after the adoption of the measure and for aid deliveries and medical evacuations to begin 48 hours after that. It demands the immediate lifting of all sieges including in Eastern Ghouta, Yarmouk, Foua and Kefraya and orders all sides to “cease depriving civilians of food and medicine indispensable to their survival”. Email “'Hell on Earth': More than 400 people have been killed in five-day assault on Syrian rebel-held area”. Feedback on “'Hell on Earth': More than 400 people have been killed in five-day assault on Syrian rebel-held area”.